Science and technology are recognised as the foundations upon which we build economic and societal value. Yet as the complexity, pace and globalisation of technology developments continue to increase, the challenges of turning technological potential into sustainable business success multiply. 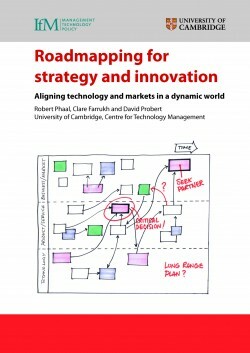 Technology roadmapping is a powerful tool that can tackle these challenges, and is used widely by companies and other organisations to address many strategic and innovation goals. Now more than a decade of research by the University of Cambridge’s Institute for Manufacturing has gone into producing the first ever textbook on strategic roadmapping. Dr Rob Phaal has been at the Centre for Technology Management at the University of Cambridge Institute for Manufacturing (IfM) since 1997. Dr Phaal is widely recognised as an expert in the field of roadmapping. He has facilitated over 200 roadmapping projects for companies, government agencies, research networks, trade associations and other organisations around the world. David Probert is a founding member and Head of the Centre for Technology Management at the IfM. He is a Principal Investigator for the IfM’s Innovative Manufacturing Research Centre. Clare Farrukh spent six years in industry in process plant and composites manufacturing environments, involving engineering projects, production support, process improvement and new product introduction work.